Credit: By Bundesarchiv, Bild 183-1989-1216-014/Senft, Gabriele/CC-BY-SA 3.0, CC BY-SA 3.0 de. The devil's finest trick is to persuade you he doesn't exist. This oft-quoted phrase from Baudelaire's short story, The Generous Gambler, could well apply to the antagonistic relationship between capitalism and communism. After the fall of the Berlin Wall, capitalism assumed a position of unparalleled power, and its ideology became entrenched as common sense. No viable alternative exists. It might need to be tweaked here and there, but capitalism is now the only deal on the table. Politicians of all stripes battle it out over problems that have capitalism as their source—financial failures, social inequalities, global warming and military conflicts—but they seek solutions exclusively within the same system. Even many protest campaigns around these problems implicitly believe that capitalism—a system that reproduces itself through exploitation—can be civilised. For Marx, the revolutionary potential of communism resides in its revelatory status: not a blueprint for utopia but a way to explain capitalism's irresolvable conflicts and flawed moral position—a means of exposing Baudelaire's devil. It seeks to redefine the meaning of wealth, and to render the principle of caring as a global imperative in place of competition. In this sense, communism is capitalism's greatest enemy, but it’s clear that this enemy must be approached with different tactics in a post-communist world. This is where spirituality comes in. 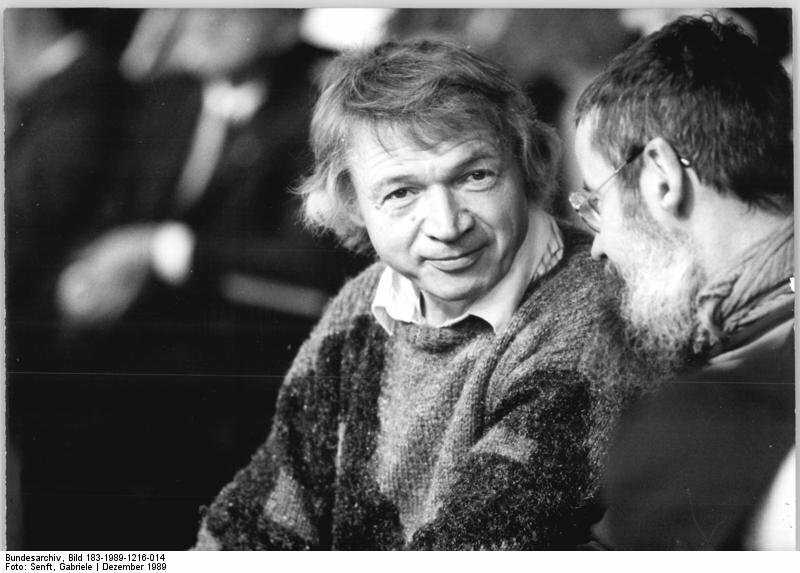 Rudolf Bahro, the German Left-Green philosopher, is perhaps the most interesting exponent of these new tactics. The motivation behind his attempted ‘spiritualisation’ of politics had its source in prison. Bahro's dissenting views, expressed in his book The Alternative in Eastern Europe, brought him an eight year prison sentence in East Germany, and the bible was the only book that happened to be available to him in his cell—a cynical move, perhaps, on the part of the Stasi. He studied it whilst on hunger strike, and although he was never wholly converted to Christianity he saw its place in the world and embraced many of its qualities. His writings reveal an acute sensitivity to personal suffering and the recognition that human needs are spiritual as well as physical and social. True to its origins, therefore, communism for Bahro was above all a revolution of the mind—an awakening. Bahro was freed and deported after serving a little over a year, thanks to a campaign in the West that had the support of such literary luminaries as Heinrich Boll, Gunter Grass, Graham Greene and Arthur Miller, as well as many New Left academics, including E.P. Thompson and Ralph Miliband. The Bahro who entered prison, however, was not the Bahro who was released; this new version of himself set out to save the world. For Bahro, a peaceful eco-communist alternative to capitalism is both possible and essential, but the belief that capitalism offers a life that is desirable must first be overturned if this alternative is to flourish. Through a variety of psychological strategies subsumed under the rubric of 'retail therapy', capitalism promotes pseudo-individualistic lifestyles, drives the desires of the self-absorbed, and promises fulfillment from the menu of all-you-can-eat. Retail therapy locates meaning in life through clothes, cars, homes, holidays and furniture. As the name implies, it even offers a way of self repair. But the working class will not be the bearer of an alternative society, he concludes. In fact the traditional labour movement's response to the problems of industrial society narrows the space for building those alternatives. Employers and trade unions are traditional power blocs which together institutionalise and manage conflict, thereby stabilising the system. It is not just the bourgeois class but the industrial system itself which threatens our survival. Seen from this angle, class struggle is not the solution. Instead, Bahro's vision is that of a post-industrial spirituality which represents values that are at variance with hedonistic tendencies, consumerism, and contemporary levels of acquisitiveness. He saw this transition as a peaceful process characterised by dissolution: we don't go in and disband something, he argued, we allow it to disintegrate by withdrawing our energy from the system. That’s not to say that this is a wholly passive process: any strategy for non-violent social change that is interwoven with the transformation of consciousness still requires a nudge. Bahro wanted to reclaim the language of transformative consciousness for an eco-socialist movement, and sought ways to summon the power of whole populations in pursuit of common goals. His focus was on a revolution of the mind—a radical renewal in keeping with Marx's German Ideology—but there is also evidence of a parallel to St. Paul's Epistle to the Romans, with its emphasis on transfiguration and metanoia: a ‘way of seeing’ completely at odds with the political philosophy of possessive individualism and capitalist exploitation. In this revolutionary process he saw the potential for overcoming common obstacles to socialism such as the tendency towards competitiveness, selfishness, greed and fear. Every major cultural transformation in history has reached into the most intimate sphere of human motivation, and Bahro therefore wanted movements for human development and self-realisation to combine within a political-psychological context. Moreover, he wanted to explore the possibilities for a spiritual awakening that are linked to such a movement. He saw the necessity to bring together all the amorphous groups that are concerned with emancipation and the rescue of civilisation into one coherent form—a mass social movement of cultural transformation. Crucially, this would consist of unity between the Greens and the socialists: the socialists need the Greens because survival is a precondition for them to attain their goals; and the Greens need the socialists because survival can only be ensured by dissolving the basis of monopoly competition. Similarly, Bahro argued, Christians need socialists, because capitalism is the furthest epoch from God. The moral stand that more and more Christians are adopting on animal rights, ecological issues, the capitalist plundering of impoverished countries and the oppression of the working class is ineffective without political action. But socialists also need Christians, for some degree of religious transcendence is necessarily bound up with subjective values—something which is frequently lost in the struggle to meet the needs of the oppressed. Bahro was not advocating that socialists convert to Christianity, but that they recognise the necessity for the re-creation of spiritual equilibrium. Socialists should be sensitive, he suggested, to the Christian precept ‘Do not store up treasures on earth,’ and to the fact that individuals require a basic level of security, not only in the material sense, but also in the sense of having favourable social conditions for the cultivation of their own inner development. Shortly before he embarked on a journey to investigate the ‘alternative’ community of Findhorn in the Scottish Highlands, I asked Bahro for his thoughts on the likelihood of a small country like Scotland gaining its independence and fulfilling his vision. He promptly replied that the problem is not that Scotland is too small, but that it’s too big. At that time he was exploring the possibilities for ‘autarkic equilibrium,’ looking at what had worked in medieval forms of communalism fused with contemporary cooperative experiments and variations on the theme of syndicalism. I imagined his idea of self-sustaining communities as something akin to eco-balanced rock pools refreshed by a wider Scottish tide. Seeing that another Scotland or another world is possible is one thing; sustaining the belief in our ability to effect that change is quite another, but that’s where Bahro’s ideas are so important. Faced with reversing the tide of industrialism, averting ecological catastrophe and avoiding nuclear annihilation, Bahro calls on all of us to sense and activate our own strength.